Recently, I was very fortunate to come into contact with the great people over at Shelby Systems. Shelby has been a major player in the church management and accounting software field for a long time now (since 1976). They were gracious enough to let me interview them today. 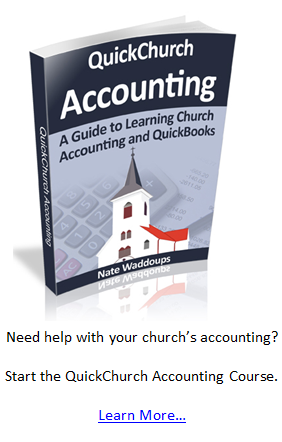 Nate: What separates Shelby Systems’ church management software from the other church software packages out there? Shelby Systems: The first thing that comes to mind is experience. As the first church management software (ChMS) company in existence, we have both longevity and stability that make us stand out. Our customers appreciate knowing that we’ve been partnering with them in ministry for 35+ years and will continue to do so throughout the future as they grow. Speaking of growth, our software products are scalable to match your ministry as you continue to add members. We serve churches currently from < 300 in average weekend attendance up to 32,000 plus, as well as large nonprofits like The Salvation Army. Another feature that stands out is the built-in reporting capability. You can run a canned report with a click, customize your own using Shelby Query or Microsoft Reporting Services, or export any Shelby fields to Excel for additional customized reporting. Our customer service is well-known for handling any issues quickly and efficiently through a number of different channels. Our Community sites are available for collaborating and networking with peers through forums, or connecting directly with Shelby reps. Lastly, having ongoing releases via the web is priceless – no waiting for an annual or bi-annual release. As tax laws and tables change, you are ensured that your records are always compliant. Nate: Would you be willing to send me a screenshot of what you consider to be one of the most useful features of Shelby Software? Why is this feature so useful? Shelby Systems: Absolutely. 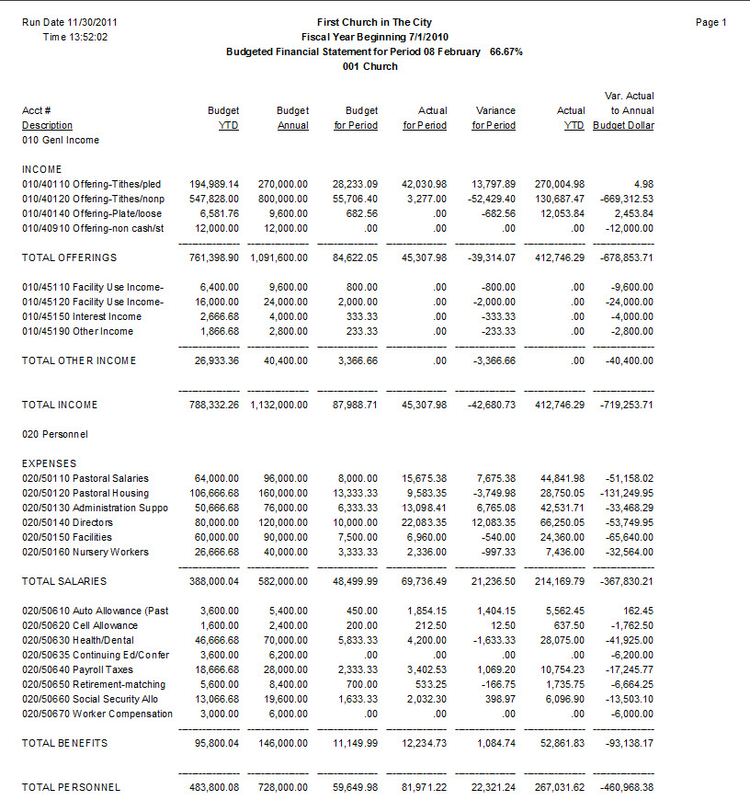 Below, you’ll see a screenshot of a Budgeted Financial Statement. I chose this feature because of the simplicity that it provides with budgeting management. This is a detailed snapshot of your budget that you can run real-time for any number of periods (or annually). The data can also be exported to Excel for additional customized reporting. It’s your data and it’s immediately available in your preferred format so that you can create reports to meet your ministry’s needs. You can choose any number of columns of data to include, making it a key tool for church leadership. Nate: It looks like you offer two different products for church management purposes: Shelby Arena and Shelby Church. Can you explain some of the major differences between these two packages? Shelby Systems: Both Shelby Arena and Shelby Church are people (“non-financial”) management products and both integrate directly with Shelby Financials. However, there are some fundamental differences between Shelby Arena and Shelby Church, including technology, implementation and feature sets. On the technology side, Shelby Church is written in Visual Basic and Shelby Arena is written using the .NET platform. As it relates to implementation, Shelby Church is our legacy, client/server product and Shelby Arena is browser-based and available for you to host on your servers or as a SaaS model, with Shelby hosting your data for you. Concerning feature strengths, both products are full ChMS packages for people management, and with Shelby Arena, you also have a powerful Content Management System (CMS) to publish and power your ministry’s website. Shelby Church has online tools such as online giving & registration that you can publish to your website, but not a full CMS. 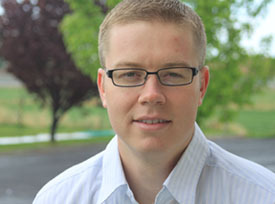 Nate: Under what circumstances should my church choose Shelby Arena? Under what circumstances should my church choose Shelby Church? Shelby Systems: The key to choosing the Shelby software that’s right for your ministry is to take a full look at what you need with features, technology and your staff’s needs. Traditionally, Shelby Arena was used by large & mega churches as an enterprise-level product, but with the launch of Arena in the cloud, it’s now a viable option for any-sized congregation for people management. Nate: Shelby Systems also offers Shelby HQ for headquarters management. Is this software only necessary for large multi-site churches? Shelby Systems: No, actually multi-site and multi-tenant capabilities are available through any of our software products. Shelby HQ offers the same features that are built into our other products designed specifically for denominational headquarters offices, regional offices, and faith-based nonprofits. Nate: It looks like there are two offerings for the HQ market: Shelby Arena and Shelby v.5. Is this the same Shelby Arena mentioned above? What are the main differences between Shelby Arena and Shelby v.5? Shelby Systems: Yes, it is the same Shelby Arena we discussed before, however, with the addition of a large feature set designed for and with headquarters offices and nonprofit needs in mind. HQ feature sets are available in both Shelby Arena and Shelby v.5. The key differences are the same as we listed before with Shelby Arena and Shelby Church. When a headquarters, district, regional office, or nonprofit chooses Shelby, the features delivered within either product are specific to their needs. Nate: What types of support are available? Shelby Systems: Support with all Shelby software is bundled with maintenance & updates and varies based on a ministry’s Shelby package. It is an annual cost. There are a multitude of support options available to Shelby churches, including: phone, email, live chat, and live assist. Also, our Community sites provide you with forums, knowledge base, documentation, and training videos. Nate: Does the Shelby Financial Suite come prepared to make financial statements that are in compliance with the FASB? What steps have you taken at Shelby to ensure accounting compliance? Shelby Systems: Yes, we have the standard reports that comply with the FASB and GAAP principles. We take many steps to ensure our accounting compliance. We have a CPA on staff and a CPA certified in not for profit accounting that consults with us on a regular basis for future and current financial products. Nate: What else would you like my readers to know? Shelby Systems: I’m excited to announce to your readers that Shelby will be releasing an online financials product in 2012! We will be leading the way with this technology and we believe this will make our software accessible to an even wider array of ministries. As we mentioned earlier, Shelby Arena will also be available now as Hosted software (SaaS), which is a huge benefit to churches without paid IT staff or those who prefer to outsource their server maintenance and updates to Shelby. We’d also love to connect with your readers through social media. They can find us on Twitter (@shelbysystems), Facebook (fb.com/shelbysystems), Google+ (gplus.to/shelbysystems), and LinkedIn. Lastly, our annual conference occurs every June and we love to host anyone with questions about our software who would like to see it in action. You can find more info about the International Shelby Conference (ISC) at shelbysystems.com/isc. We’re also running regional demos, so be sure to ask us when we’ll be coming to a city near you. If you have any additional questions, feel free to contact us (shelbysystems.com/contactus) any time or if you prefer us to follow up with you, please go to shelbysystems.com/moreinfo. Thank you so much to Nate for taking the time to chat with us and review our software. We can’t wait to connect with your readers. Be sure to tell us that Nate sent you!